Please get back to me when you try them, I’m interested in what others think about which engine is better. I made a 3D Android game using libgdx back in 2011. I actually contributed a little to improve 3D skinning animation performance and model loading. Overall it was a great experience, I shipped my game thanks to libgdx being a nice framework to work with. I’ve also made quite a few smaller games with Unity3D (as a day job!). Again a great experience but in a different way. I think the 2D / 3D thing is a bit deceptive; for me it’s more about tooling. Unity’s editor and IDE, with the debugging and profiling power it gives you, can be extremely useful. But libgdx has a big ecosystem too, things like Spine have given it a big boost for doing 2D graphics. So maybe tooling-wise, libgdx just has more available in the 2D space. But for actually writing code, it’s got decent 3D support. Try to choose the best tool for the job! IMHO these are both top in class tools for indie game devs. But which to choose for a heavily GUI + text based pprojec? I would probably go with native experience here and use Android SDK with it’s own views and lifecycle. I would also like to see something like that. Cross-platform, when it’s done right, will be the next big thing. Did not know for Overlap2D, I’ll check it out, seems pretty cool, thanks! Awesome content dario! Thanks for that. My current doubt is, can I make a smooth side scroller game with decent graphics using libgdx? All the games which I found in Google play and libgdx forums lack the quality (game flow wise and graphic wise) which I’m expecting. It really depends on what is your definition of decent graphics. If you want a side scroller with 2d player/enemy sprites and parallax background but which are drawn amazingly – that can be done with libGDX. Also you can make it look smooth, responsive and great. But if you want some 3d models in a side scroller with a lot of animations, then I would suggest something else. Not saying that it can’t be done with libGDX. It can, but it could be a bit tricky. You tell everything any needs to know to have a brief description of what can we face to in both tools. I think the overlap2d has so much bug. and libgdx just need a ui editor!!! If you don’t mind, how about stuff some of the engine’s game. 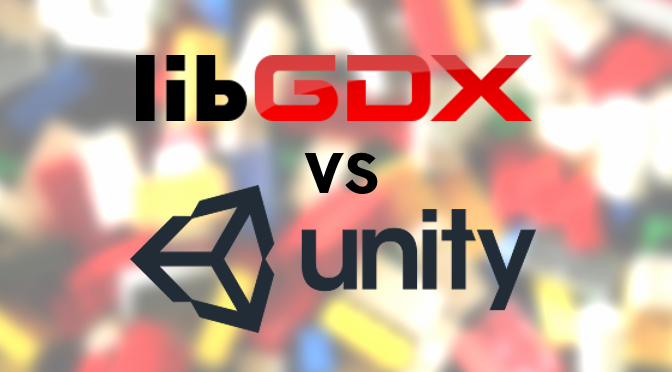 I am personally a big fan of LibGDX (Although I have mostly used it for 2D games). The Java framework is mature and the community very helpful. There are many tutorials and people will answer your question on stackOverflow, very quickly. That said, it is true that Unity is massive and has far more resources available. There are arguments against starting with such head start (This blog post is quite interesting: http://gamkedo.com/how-to-program-games/ ). In my personal opinion, one of the drawback from LibGDX is that it is mostly used by Java developers, such profile is not particularly good with graphics, and there are a lot of Java developers out there. What it means: many games with chunky graphics are being published and give an impression that it is hard to produce a polished looking game. The point is: your game will be as good looking as you make it. Hi Dario, I am working on some experimental project which outputs models as voxels in .obj (triangles or quadrilaterals). Now imagine I would like to start building some universe where I would like to manipulate/animate these models/objects. The number of objects could be quite hi (thousands and more). What framework with Java support (if any) would you recommend? My high expectations were at libGDX, but more I read I get impression about it more focus on 2 dimensions only/mostly. Thanks for great article. Nice article dario, I have one question for LibGdx, is it possible to make gui with drag n drop in a simply way? Thanks for compiling such nicest information in your blogs. Articles are very informative and hope again I’ll find more like that from your blog. Amazing blog man… it cleared my mind which platform or engine to choose for making games. Thank you for this article.